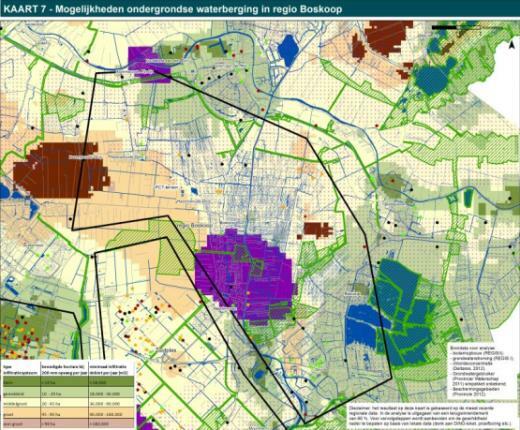 Greenhouse horticulture in the Province of South Holland already makes use of subsurface water storage in areas with fresh/brackish groundwater in order to address its irrigation water shortages. By adapting the injection and abstraction system, subsurface storage also offers a high-yield (partial) solution in areas with brackish/saline groundwater. 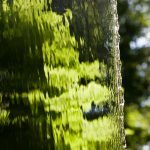 This is the conclusion of research carried out by KWR Watercycle Research Institute on behalf of the Province of South Holland, and in collaboration with the Water Buffer Foundation and LTO Glaskracht Nederland. 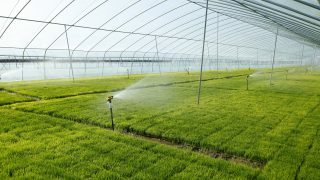 In its ‘Spatial and Mobility Vision’ the province establishes that in (greenhouse) horticulture areas priority should be given to the implementation of freshwater storage in the first aquifer as a (partial) solution in meeting the sector’s water demand. This avoids competition for space in the subsurface, for example, with energy storage systems. Greenhouse horticulture has a continual need for sufficient, good-quality irrigation water. The quality of rainwater is so high that it can be used without extensive treatment, but it is not always available: there is in fact a mismatch between water demand and water supply. In the winter there is too much rain, while in the summer shortages occur. To address these shortages, horticulturalists today depend on other sources, for example, groundwater that has been desalinated using reverse osmosis. The mismatch is also dealt with in practice by capturing and storing rainwater in above-ground reservoirs. The capacity of these reservoirs is not always sufficient to capture all of the precipitation, so that a possible source of quality water is lost for the horticulturalists. In areas with fresh groundwater, such as the Oostland horticulture area, surplus rainwater is also stored in the subsurface. It can then be recovered in periods of shortages. This subsurface storage offers the advantages of a large capacity, relatively low costs and limited use of surface space. Over the past few years the technique has been further developed to the point where rainwater can also be stored in groundwater that is brackish/saline. 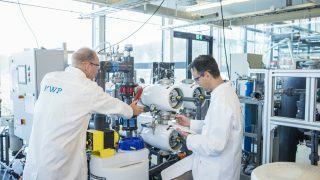 Several horticulturalists in the provinces of Zeeland and South Holland have gained experience in pilot studies in which rainwater is stored in brackish/saline groundwater using adapted injection and abstraction techniques. The yields achieved are very encouraging: it is certain that good-quality water can be recovered. Water storage in the fresh to saline subsurface is therefore a promising (partial) solution to address irrigation water shortages for horticulturalists in South Holland. The aquifer’s thickness (the thicker the aquifer the greater the volume of water that needs to be stored in it to create a freshwater bell of sufficient robustness). The groundwater’s salt concentration (the higher the groundwater salinity the more freshwater is lost through mixture with the ambient water). The groundwater flow (the faster the groundwater flow the more the freshwater mixes with the surrounding water). This information was taken into account in the analysis. The results show that not all locations are suitable for small-scale (parcel level) water storage systems, but that larger, more robust systems – for example, collective installations – or smart adaptations to well design could offer possibilities to such locations. 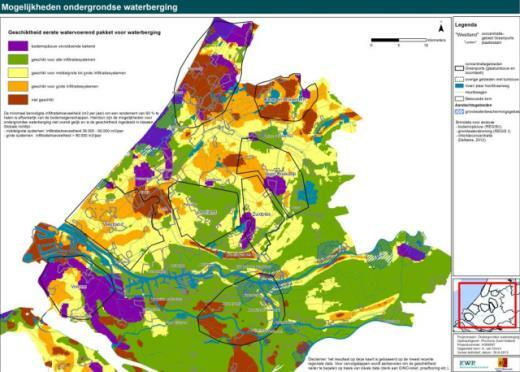 The results of the research are available (in Dutch) on the Province of South Holland website in the form of suitability maps of freshwater storage in (greenhouse) horticulture areas. There is also a report which includes the possibilities and main features of the technique, as well as relevant background information. It also presents a closer examination of the potentials of the different (greenhouse) horticulture areas.